Real estate agents, salespeople and department store clerks are all known to often work on commission, but another industry has been quietly changing into a commission-based enterprise, and most consumers would have no way of knowing: the local dentist. “What? Are you working on commission?” Jenna remembered a patient saying to her once as she laid out all the options available to him. Little did he know his joke was more than just that. “You are in sales,” Jenna was told in a company training session. The trainer was a dentist, sent by the company to inform hygienists of the company’s philosophy. Phrases like “closing the deal” were used as the trainer made sure to repeat that the company’s hygienists are not in dentistry, but in the business of selling products and services. Jenna is a dental hygienist in Arizona and, like many others, is working on commission. The Arizona Mirror has changed her name because she fears she will lose her job for speaking about her concerns with the industry. The dental practice she works at is owned by a larger company, not the dentist himself. It is part of a national trend that has been slowly gaining momentum since the Great Recession and one that an average consumer would never notice. Much like how newspapers started getting bought up by large corporations in the 1980s and 1990s, dentists are increasingly selling their practices to large out-of-state business interests who then manage the business side of cleaning teeth – and maximizing the practice’s profits. One of the companies that owns practices in Arizona, Dynamic Dental Partners Group, is owned by a private equity firm that targets companies that make more than $200 million a year. Pacific Dental Services, which operates more than 600 dental offices in 19 states, including 72 in Arizona, had nearly $1.2 billion in revenue in 2017. In 2017, there was a 31-percent increase from the prior year in the number of business entities that registered as dental practices, according to data from the Arizona Dental Board. But with this trend comes new problems. It’s not a new problem, either. When Earle was in New Jersey in 2010, he had heard about a case where a dentist ran a patient’s credit and found they had a large line of credit available to them and he tried to upsell him on care. “It’s a perverse incentive,” Earle said. Very few industries weren’t affected by the Great Recession. A decade later, many of them are just now beginning to bounce back. Before the economic downturn of 2008, the dental industry was thriving. People had disposable incomes, and were more willing to purchase specialty procedures like teeth whitenings or veneers. Some even saw the dental industry as a great place to invest, and the market started to boom. Dental offices started popping up all over the Phoenix-metro area, and the pay for support staff, like hygienists, was good. Once the recession hit, all that started to disappear. Patients stopped coming in for annual cleanings, and those who did wanted to spend the bare minimum on care. No more whitenings, no more veneers and fewer customers as patients tightened their belts. Additionally, many practices were stuck with an overhead rate of 75 percent or more, according to Earle. “Everything is capital investment when it comes to dentistry,” Earle said. Over a hundred dental businesses shut their doors during this time, he said. Ten years later, and Earle calls the dental industry “stable,” but it was slow going. Jenna remembers those pre-recession years well. She had just got into the industry and was making $40 an hour. Ten years later, and things have gone a bit downhill for Jenna. Despite nearly a decade of work under her belt and a growing list of certifications to her name, she has taken a reduction in pay, is working on commission and is one of many in a now-saturated market that she says is becoming “corporatized”. The dental industry is more than just dentists. There are dental hygienists, dental therapists, denturists and dentists. Each has a specific set of services they are allowed, by law, to provide, and different rules and regulations to follow. In Arizona, there are 4,854 dentists, 4,559 dental hygienists and 10 denturists, according to the Arizona State Board of Dental Examiners. Dentists and dental hygienists are at a nearly 1-to-1 ratio even though the role of hygienists is limited in Arizona. The general role of a dental hygienist is to clean a patient’s teeth and do many of the things a dentist can do. More often than not, the person a patient interacts with the most at a dental office is a hygienist. Dentists usually do the higher level jobs that only they can do under Arizona law, like adding crowns, fillings and teeth removals. The jobs that dental hygienists can do in Arizona is different than other states. In fact, the roles of hygienists varies from state to state. For instance, in Arizona, a hygienist can’t work without the direct oversight of a dentist, but Colorado hygienists can have their own practices. Despite that, the hygienist industry has continued to grow since 2008. The U.S. Bureau of Labor Statistics has found that the number hygienists is expected to grow by 20 percent by 2026, much faster than the growth rate in other industries. That is due in part to the rise of new programs that help fast-track the process to become a dental hygienist. When Jenna became a hygienist in the mid-2000s, she went to school for two years, practiced on models before moving on to practicing on her peers, and then finally moved on to real patients. Carrington College now offers a dental hygiene program that can be completed in just over a year. When the Great Recession ended, there was only one place to be trained as a dental hygienist in the state. Now there are six, and they’re producing a “huge number” of new hygienists, Earle said. A saturated market means more competition, which scares people like Jenna who feel that, even if they wanted to find another practice that wasn’t owned by a larger entity, they may not have that option with such a large pool of candidates. Additionally, she worries that people will not speak out on things they’re concerned about because they know they can be replaced easily. With the industry starting to come back from the Great Recession and an influx of qualified employees, the stage was set for conglomerates to move into the dental industry. The practice Jeanna works at used to be a private office, but the dentist decided, like many others, to let someone else handle the business side. “We were told that commission would keep us on our ‘A game,’” Jenna said she was told when she first found out about the new policy. Now, she is trying to do more work in less time in order to meet quotas and appease the company that owns her office. The company she works for expects her to see eight patients a day, meaning she can’t spend the hour with each patient that she used to. Add on that working as a hygienist can be a high stress environment, and Jenna said it’s left her and her peers feeling burnt out and nervous. 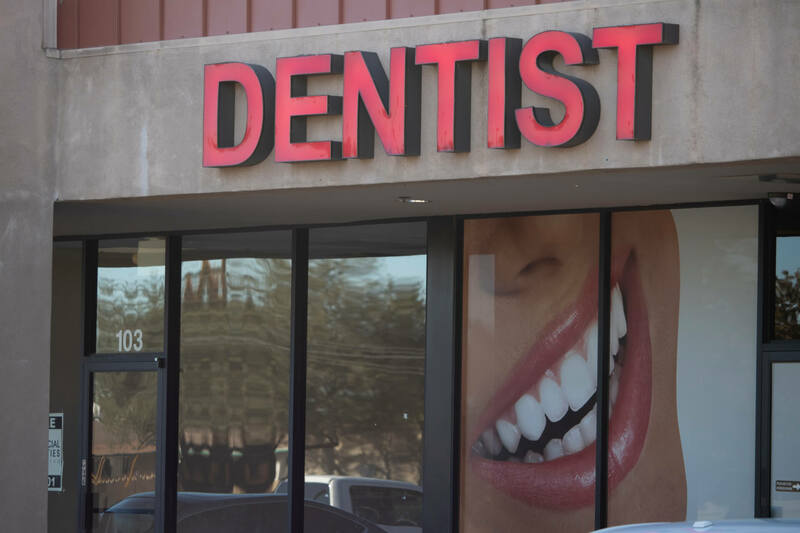 “We are going to start seeing dentistry move to a CVS/Walgreens model,” Jenna said, adding that an emphasis on uniformity among practices and seeing the maximum number of patients a day is becoming the norm across the greater Phoenix area. But dentists are taking this path because it is attractive to them. Most dentists enter the profession with upwards of $400,000 in debt, Earle said. “They’ve got a family to feed, a mortgage to pay and school debt to pay,” Earle said, adding that he encourages new dentists to look over their contracts before signing on to work with one of the larger dental groups. The three main companies are Gentle Dental, Dynamic Dental Partners and Pacific Dental Services. The Mirror reached out to the companies to discuss the concerns of dental industry professionals, but did not get a response. In Arizona, it is illegal for a company to interfere with a dentist’s clinical decisions. But there is nothing that prevents them from pressuring the local practices they own to see more patients and use high-pressure sales tactics to get them to buy whitening and veneer packages. As for Jenna, she is crossing her fingers that someone will take up the fight of commission-based policies at dental offices in Arizona, but she isn’t holding her breath.